Memory is a funny thing. With no intent to wax psychologically, it doesn’t take a Carl Jung to figure out humans do a better job of storing those memories that are satisfying and euphoric, rather than those that are upsetting or painful. And one thing that never failed to paint a promising picture of childhood jubilation was toys. Awesome toys. Monster truck toys! It wasn’t only Bigfoot that reigned in the minds of impressionable young males in the 80s. Trucks as toys came in an endless array of shapes, sizes, styles, and functions. Before radio-controlled Hot Wheels became the rage, battery-powered vehicles dominated the toy truck market. Of course, they had to offer something other than simply ‘moving forward.’ A number of manufacturing companies offered variations, but Lewis Galoob Toys, Inc. was the toy maker to beat. A truck with a built-in bridge. This was one of those toys that sadly made too many kids worry over what they might be missing from life’s great puzzle. Surely if there was a toy with the ability to cross over impeding land gaps with its own supplemental bridge, why don’t real trucks, traversing through real situations, employ this same technique? Perhaps the “Cross Boss” ended up in too many storm drains while navigating street corners. 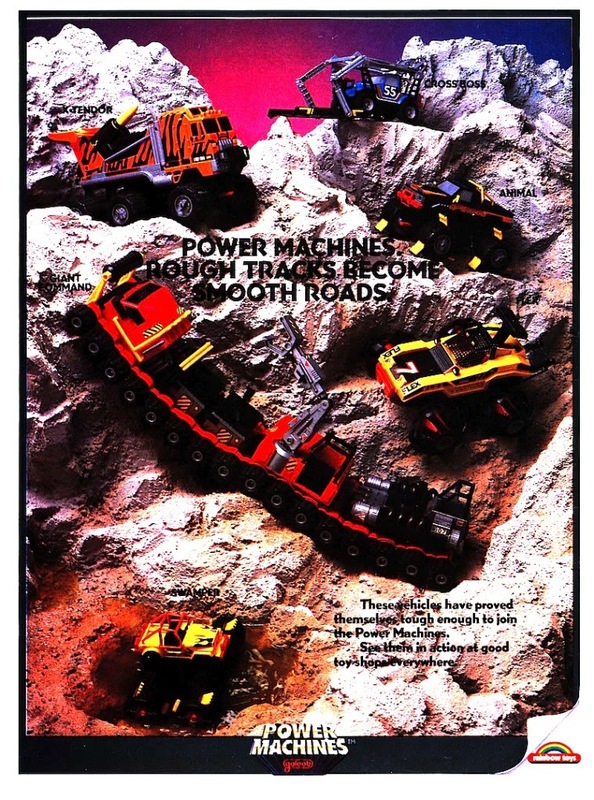 A number of other Power Machines enriched the Galoob toy truck line, including “The Flex” and the “Giant Command.” All truck toys that seemed to do the impossible: navigate immovable objects, negotiate land and water terrains, and even climb walls (okay, Giant Command couldn’t actually climb walls, but the commercials made it look like 90-degree treks were par for the course). But they’re were a few other toy producers out there that set their own bars with the youthful wonderment of trucks. One of the most coveted trucks during the 80s was “Rhino” from Kenner‘s M.A.S.K. toy line. M.A.S.K. filled a void between Transformers and Go-Bots. The vehicles changed, but they were still “man-powered.” Thus, the alien concept was eliminated and a human element lent a sense of credibility. Though I’ve yet to see a Camaro with functional wings, much to my chagrin. Wow; what is up with snarling kid halfway through the commercial? Lighten up; it is just a cartoon series.